Conversations with the Creators of Science Fiction, Fantasy and Thrillers! Todd is the mastermind behind the redesign for Advanced Dungeons and Dragons 3rd Edition. 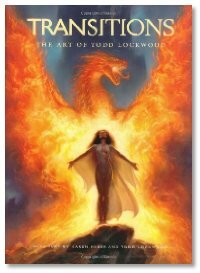 He also creates the wonderful book covers for Tor and Wizards of the Coast (he "designed" the look of Drizzt). Todd was the Artist Guest of Honor at the recent CopperCon convention and graced us with an in-studio interview. His collection, Transitions, is available. It what may prove to be one of the more controversial books we've had on the show in a while, Ken presents Eden: The Novel. The controversy doesn't come from the content of the book, a futuristic tale of terraforming and idealistic genetic engineering gone awry, but how Ken came up with the concept. We'll let the interview speak for itself. Open your mind and give it a listen. And check out more from Ken at Dark Regions Press. Lucas sez back off, pissy fans... I'll change what I want! I wanna see Hef's SuperBunnies! Evo steps up to the plate again and unloads on folks who make cell phones for... your dog. As of December 2014, The Dragon Page is closed. No more episodes of "Cover to Cover", no more book reviews. For those seeking more podcast options featuring only topics on reading and writing SF genre literature, we highly recommend Mur Lafferty's I Should Be Writing, Mur Lafferty and Matt Wallace's Ditch Diggers and Writing Excuses featuring Brandon Sanderson, Dan Wells, Mary Robinette Kowal and Howard Tayler. There will also continue to be related non-fiction book reviews and coverage at Slice of SciFi. Thank you all for your opinions, conversations, contributions and support over the years.